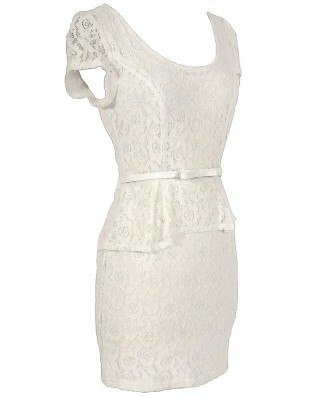 Classy and ladylike describes this dress made entirely of ivory floral lace. 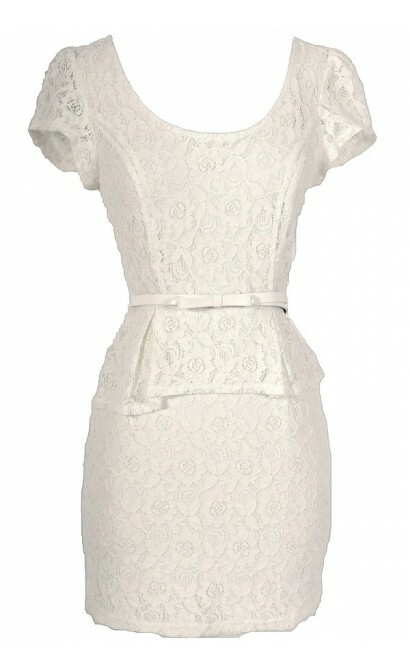 The High Society Ivory Bow Belted Peplum Lace Dress is fully lined except at the sleeves which are semi-sheer. It has flattering princess seams down the front as well as cap sleeves. The attached skirt has a classic pencil cut with a peplum detail at the waist. This dress comes with a matching belt with a bow in the front, adding the perfect extra detail to this dress. An invisible zipper completes this look. The High Society Ivory Bow Belted Peplum Lace Dress is perfect for any event where you want to look elegant and sophisticated—it reminds us of something Kate Middleton would wear. This is also a great option for brides to wear to a rehearsal dinner or any pre-wedding festivities. It looks great with or without the belt. Details: Lined. Belt included. Hidden back zipper. 100% cotton. Hand wash cold water separately. Color will bleed. No bleach. Hang to dry. Small measurements: Length from top of shoulder to hemline: 32”. Bust: 34”. 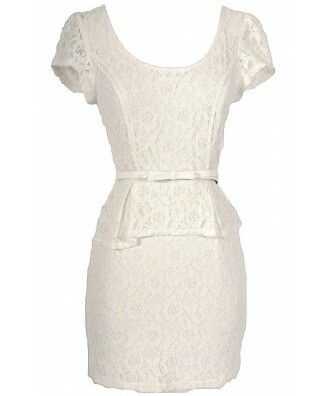 You have added High Society Ivory Bow Belted Peplum Lace Dress into Wishlist. You have added High Society Ivory Bow Belted Peplum Lace Dress for Stock Notification. 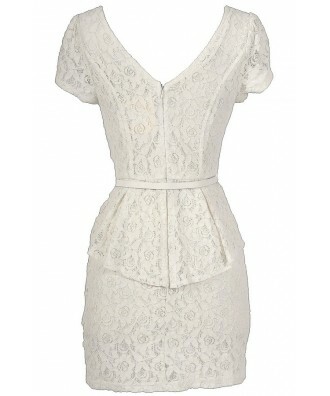 You have set High Society Ivory Bow Belted Peplum Lace Dress as a loved product. You have removed High Society Ivory Bow Belted Peplum Lace Dress as a loved product.